Welcome to the February 2018 edition of the Curious Tea subscription! As usual we have four exciting new teas to share with our subscribers this month. This month we are featuring a black and a green version of the same tea – one set of teas from South Korea and one set from Shandong Province of China. The first light tea this February is a grassy and vegetal green tea from Boseong in South Korea that is grown at an organic tea plantation by the Choi family. 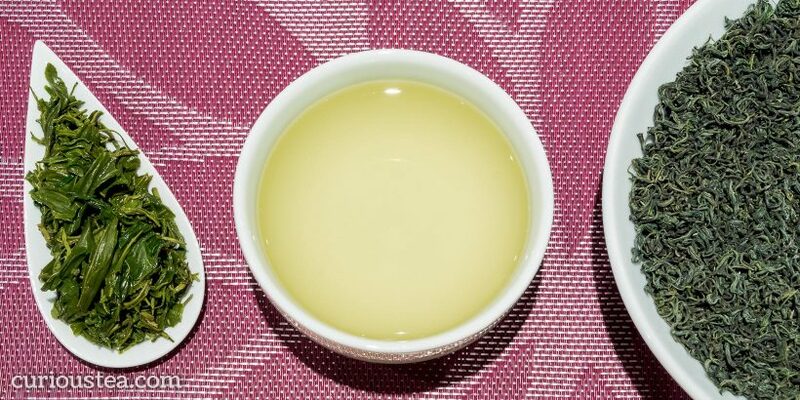 The second light tea is another classic vegetal green tea, this time just across the Yellow Sea from South Korea, from Shandong Province of China. For the darker side of the selection we opted for a light and refreshing black version of the South Korean green tea. And finally, the last tea for the dark side of the selection is a black version of the green tea from Shandong Province that has a unique floral character. Mixed: Boseong Jungjak Nokcha and Boseong Jungjak Hongcha. Our Discovery subscription boxes contain 10g taster pouches of all of the above mentioned teas. As always, if you are a subscriber you will benefit from a 10% discount on all teas from our tea shop! Let’s get into further detail on the products featured in our February tea subscription boxes. Boseong Jungjak Nokcha (보성군 중작 녹차) is an organic green tea from the Choi family plantation. Located in the famous Boseong County of South Jeolla Province, they produce some classic teas that all have a distinctive ‘Korean’ taste and unique characters. The spring Jungjak (중작) grade is plucked in early May and is the third flush. This tea has full organic certification, was picked in 2017 and is sourced by us directly from the Choi family. Korean teas are distinguished by having a clear classification system of flushes. The first flush Ujeon (우전) is the most prized one, which is the ‘pre-rain’ picking of the tea leaves. This is followed by Sejak (세작) ‘thin sparrow’, Jungjak (중작) ‘medium sparrow’ and Daejak (대작) ‘big sparrow’ flushes. These names refer to the shape and size of the leaves and their resemblance to sparrow tongues. The earlier the harvest, the more expensive the tea is. Earlier harvests also have more intense characteristics and heavily feature dominant green, savoury and umami flavours. We visited the Choi family plantation in early spring of 2017. While still being early for the first harvest of the year we were able to see their beautiful plantation and facilities. The family has owned this plantation for 3 generations and the tea making knowledge passes down from one generation to the next. Sampling some of the teas, our particular favourite was a traditional fermented tea, or Hwangcha, handmade by Mr Choi’s grandmother according to her secret recipe. This traditional Hwangcha will be soon available in our online shop. We were equally impressed by the classic green and black teas offered by the Choi family plantation. 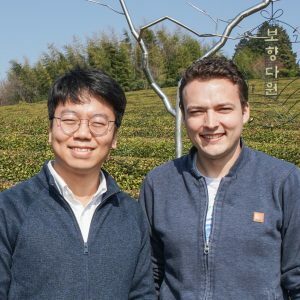 They take great care in producing their organic teas and this results in some fantastic teas that showcase unusual traditional Korean tea flavours. This tea is a Nokcha (녹차), meaning it is a green tea. It is processed as a classic green tea according to the traditional way of tea processing in Korea, resulting in a style that is somewhat similar to a Japanese green tea. This Boseong Jungjak Nokcha has small twisted dark green leaves with a fresh vegetal aroma. The liquor has a bright yellow-green colour with a savoury vegetal taste. It is light but quite grassy and smooth, with a mouth-coating texture. The flavours are savoury and umami, with notes of citrus and a creamy finish. It is best brewed at 70°C for 2-3 minutes and should be brewed multiple times. You can also buy Boseong Jungjak Nokcha green tea in our online shop. Just like the Nokcha green tea, this Boseong Jungjak Hongcha (보성군 중작 홍차) is an organic black tea from the Choi family plantation. This tea is also a Jungjak (중작) grade, so it is made from exactly the same leaves as the Nokcha, but it has been allowed to oxidise to produce a black tea with a distinctive Korean black tea character that is very light. This tea is also fully organic, was picked in 2017 and is sourced by us directly from the Choi family. Having discussed the different grades of tea in Korea above, this gives us an opportunity to discuss the different types of tea that are produced in Korea. 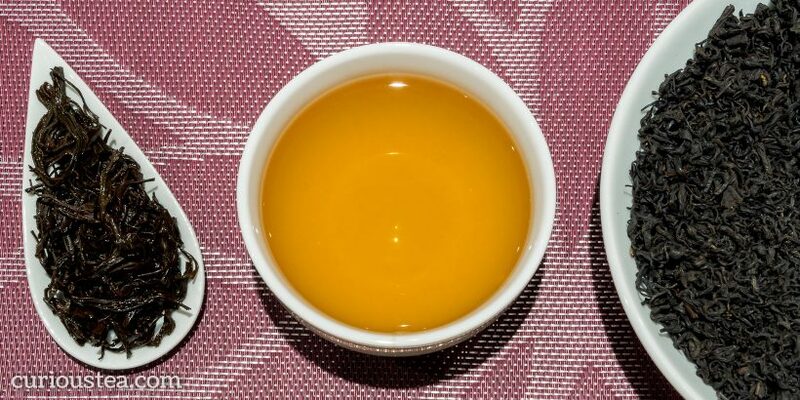 While they broadly follow the types of tea that everyone is used to from other countries, they do have interesting classification and a distinct terminology. We tend to follow the Korean terminology at Curious Tea in order to accurately describe the type of tea on offer. Broadly speaking, there are four types of tea produced in Korea. Nokcha (녹차) green tea is the most common type and is an unoxidised green tea. 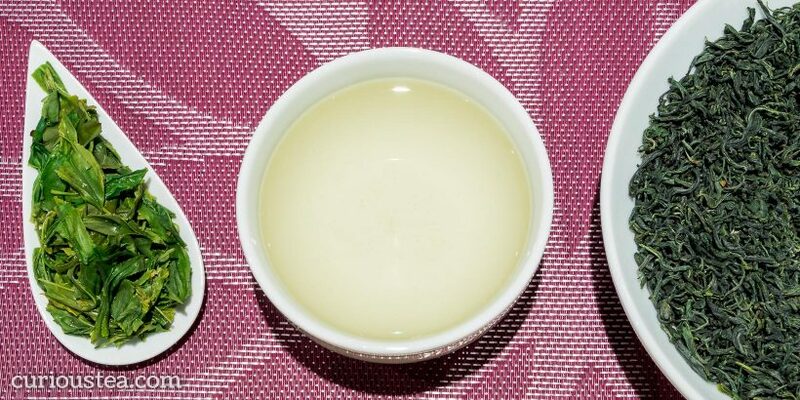 Hwangcha (황차) ‘yellow tea’ is a partially oxidised tea that is unique to Korea. It is not the same a either yellow tea from China or oolong tea, but rather is a wide range of partially oxidised and sometimes partially fermented teas from Korea. Each tea master will have their own version of Hwangcha and their own unique method of production so it is extremely difficult to exactly define this type of tea. Hongcha (홍차) ‘red tea’ is a fully oxidised tea that is closest Korea produces to a ‘traditional’ black tea. Finally there is the very rare Tteokcha (떡차) ‘cake tea’ and Doncha (돈차) ‘money tea’ that are both post fermented shaped dark teas akin to pu-erh. This Boseong Jungjak Hongcha is made from exactly the same leaves as the Nokcha featured this month. 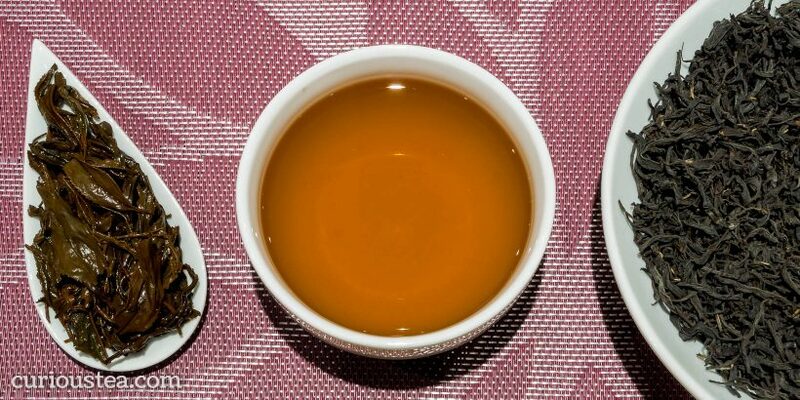 The only difference is that while the Nokcha is an unoxidised green tea, the Hongcha is a fully oxidised black tea. Having a green and a black tea not only from the same place, but also that are crafted using the same leaves makes for an interesting comparison and a showcase of the oxidation process being the main difference between a green and a black tea. It is not uncommon for people unfamiliar with tea to think that green tea and black tea are somehow very different, even thinking that they are from different plants. Interestingly, this misconception was also common when all tea in the world did come from China – the merchants of the East India Company and others traded under the assumption that the green and black teas they were buying came from completely different plants. This misconception only started to come to light in 1840-1850s after the successful spying and tea smuggling missions into China that were conducted by the botanist and plant hunter Robert Fortune on behalf of the East India Company! This Boseong Jungjak Hongcha is a black tea that has small black twisted leaves with a light malty aroma. The liquor has a light amber colour. The character is very light, slightly malty, creamy and fruity. It has a wonderfully smooth yet satisfying flavour with notes of raisins, menthol and eucalyptus. There is no astringency, only a slightly tart aftertaste. Overall a very pleasant light black tea that is rather unique. It is best brewed at 90c for 2-3 minutes and can be re-brewed multiple times. You can buy Boseong Jungjak Hongcha black tea in our online shop. Shandong Laoshan Green (山东崂山绿茶) is a classic green tea from Laoshan Village in Shandong Province, one of the most northerly tea growing areas of China. It is grown at low altitude of just 300m next to the Yellow Sea, slightly more to the north than our Boseong Korean teas featured this month. This tea is grown by a small family operation that do both tea growing, harvesting and traditional processing. Just like the Korean teas, the two teas from Shandong that we are featuring this month are also from early May 2017 harvest. The adverse weather conditions, even with the help of the extra covering of the plants for winter, lead to much slower tea plant growth. This is similar to the effect that high altitude has for plant growth. With slowing growth, the tea plants are much less productive but this does lead to a more concentrated flavour in the new plant growth each spring. It certainly means that while there is less quantity of tea, the flavour characteristics are much improved. 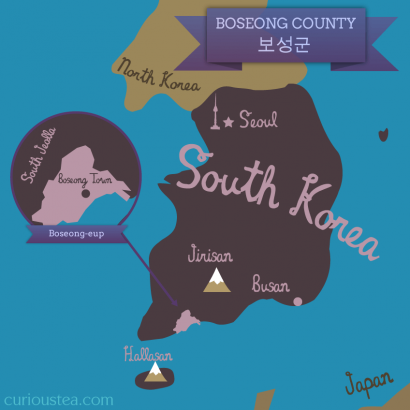 Our Korean teas from Boseong this month have the same dimension. While not being grown in a climate cold enough to be needing cover, they still have to survive a rather cold winter. It also leads to a more complex and concentrated flavour each year and this flavour similarity is quite apparent amongst the Korean and Shandong green teas. You can also buy Shandong Laoshan Green tea in our online shop. Our last tea this February is Shandong Laoshan Black (山东崂山红茶), a black version of the green tea from Shandong above. It comes from the same tea growing family that manage the whole tea making process themselves. It is from the same early May 2017 harvest but has been allowed to fully oxidise to make a fantastically floral black tea. This tea from Shandong Province is grown at Laoshan Village, next to Laoshan (崂山). Also known as Mount Lao, this mountain is located close to the coastline and is a popular tourist destination. The popularity of Mount Lao arises from the long affiliation of the mountain with Taoism, being considered as one of the “cradles of Taoism”. While there are strong links between Taoism and tea and perhaps you would expect to find some tea being grown in the Laoshan temples, tea was planted here only rather recently. Still it seems that the holy Taoist Laoshan is a rather appropriate place to grow such great tea! This Shandong Laoshan Black tea is the fully oxidised black version of the Laoshan green tea above. It has small wiry twisted and rolled leaves. It produces a light liquor with a fantastic floral aroma that is reminiscent of roses. This tea has a brisk flavour that is very smooth and tangy with a floral character. There are lovely notes of rose, caramel and hazelnuts. This tea produces a flavoursome yet light cup with no bitterness or astringency. The flavours always make us think of rose Turkish delight! 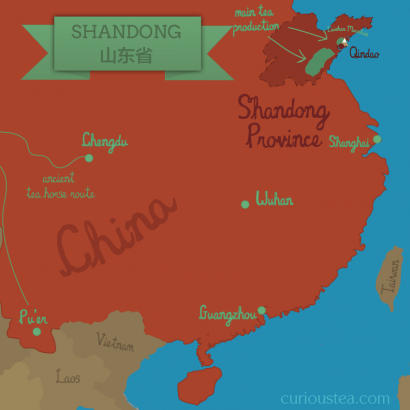 You can also buy Shandong Laoshan Black tea in our online shop. We really do hope that you enjoy the tea selection for February and are looking forward to the next instalment in March! If reading this has made you curious about our teas, but you don’t subscribe to a monthly tea selection, you can sign up for future tea boxes in just a few clicks. We ship worldwide from London, UK. We always love to hear from you, so if you have any questions, suggestions or just want to chat about tea, email us at contact@curioustea.com, via our Facebook page or via Twitter. This entry was posted in Monthly boxes and tagged black tea, China, green tea, South Korea on February 21, 2018 by Curious Tea.